A stunning bouquet arrangement of bright pink blooms representing the crisp countryside and entering Spring. 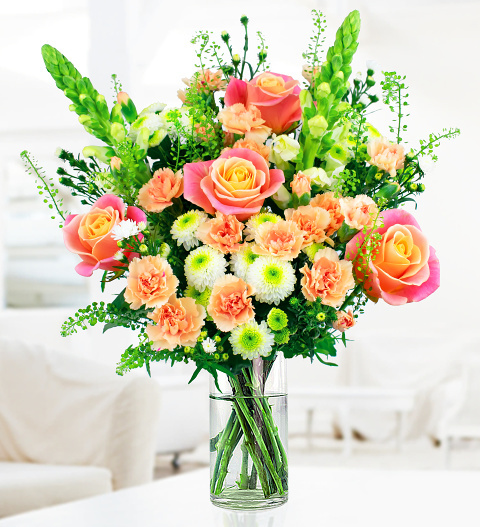 This bouquet is one of the first of our Spring collection made to make your home or your recipients look amazing! Our expert florists decided to create this wild country bouquet with a variety of stunning blooms like Dutch Coral Roses, Peach spray carnations, Snapdragons and Thlaspi. Send this beautiful bouquet to a friend or loved on their birthday, celebrations, anniversary or even treat yourself and place this bouquet in the centre of your dining table for that extra impact. Don't forget to include a special message and perhaps even something extra like a balloon, birthday cake, or luxury chocolates to make the gift special. Chocolates may contain nuts.